To succeed at any exhibition, you need to have a highly impactful exhibition design that will allow your brand to stand out from the competition. Your goal should be to provide an efficient yet welcoming environment where your sales team can effectively meet potential new customers and market your company. Our exhibition designers can help you achieve this. At Finesse Group, we focus on helping you create a ‘wow’ factor, but we go beyond that to also carefully create an exhibition design that will get more people engaged in discussions with your team. Our talented exhibition design and build teams will work together to create an exhibition booth brief while developing a complete understanding of your brand. You will work with an exhibition designer, who will ask you to define your company’s objectives so they can learn as much about you and your industry as possible. This will allow our exhibition stand builders to know exactly what they need to do to help you succeed, and they’ll create a design that will fit in perfectly with your marketing goals. From there, our exhibition designers will utilise state-of-the-art technology to present a proposal in 3D, along with animations that will allow you to view your new stand from every angle before construction and installation even takes place. This will ensure the project will turn out exactly as you envisioned it would. 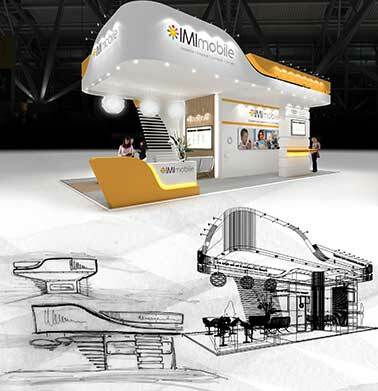 No matter what you are looking for, our exhibition designers will help you achieve greatness. Get in touch to find out more.